Attention! The Prefect of Audiovisual Programming has decreed that the latest iteration of The Skyship Chronicles must be fit for retransmission in random sequence; therefore, heavily-serialized plotlines are officially forbidden. And it will have not one, not two, but FIVE cute kids. - This episode contains a scene in which a member of an alien species writes in English using a pen and ink. This is unusual considering most alien writing depicted in Star Trek is made up of alien-looking characters. - Although Tuvok describes the planet as having a high rate of rotation "like a quasar", this property more accurately describes a pulsar. - This episode is notably similar to the novel Dragon's Egg, by Robert L. Forward. The novel also involves a Human space ship observing the extremely rapid evolution of a society on a star about which the ship orbits. - The book Star Trek 101, by Terry J. Erdmann and Paula M. Block, lists this episode as one of the "Ten Essential Episodes" from Star Trek: Voyager. - Obi Ndefo previously played Drex, Martok's son, in the Star Trek: Deep Space Nine season four premiere "The Way of the Warrior". "We might miss the rise and fall of a civilization." "So, we'll watch the next one." "Oh...glad to meet you. Where are you from? Please stop shaking our planet." "Yes. He was my... son." "If you've ever wanted to report more than the weather, now is your chance. Tell them to clear Central Lake of all traffic: Orbital 1 is coming in for a landing." This is easily in my personal top five of VOY episodes—very likely top three. It's such a classic sci-fi concept, with such a strong element of that pioneering spirit Trek is supposed to have, and executed so well that it's hard to tear your eyes away (or, heh, to blink). I probably wouldn't put it in my top ten of the franchise, though; the story's too rushed (hard to avoid in some ways, but they might have made it a two-parter if they weren't evidently wedded to the notion that a two-parter means action and combat and hostile aliens), and though the hook is great, it's also been done: we see elements here of TOS: "WINK of an Eye", TNG: "First Contact", that one Simpsons episode with Lisa's tooth, and others I'm probably forgetting. (TV Tropes calls this "Year Inside, Hour Outside." It also claims that the episode "was originally titled 'Wink of an Eye', until someone realized there'd been an unrelated (but unfortunately not dissimilar) TOS episode with that title." What I think makes this one special is that the script demonstrates a more fertile imagination for the details than is customary for VOY, and frankly, for Trek one-shot aliens in general. Their culture is vividly rendered, and overall plausible. Solid acting by guests (including Daniel Dae Kim of Babylon 5 and Angel) helps too. But I still say "Distant Origin" might be this series' only flawless episode. Bernd Schneider of Ex Astris Scientia correctly points out that this episode is reminiscent of the game franchise Civilization; what's funny about this is that Civ is one of my obsessions (I've been playing various iterations of it just about continually since the very first installment in 1991), and I didn't make that connection—at least not consciously. It may be part of why I find the episode so engaging; certainly, the analogous Simpsons episode always fired my imagination too. Also, courtesy of Bernd, here's a rabbit hole about VOY's handling of temporal shenanigans, which includes a section on this episode's adherence to both real-world-science and Trek-science. This is one of the episodes that I'll cite as an example of a great one-off episode where the show got it really right, even though the show flubs consistency and continuity in general. I took the episode title as an intentional tribute to "Wink of an Eye", and I'd add DS9's "Children of Time" to the list of similar episodes, with their ship getting caught in/on a planet where timey-wimey is wibbly-wobbly. (I didn't particularly like that episode, making this one the rare instance where VOY did it better IMO.) There's also a George R.R. Martin story, "Sandkings", involving a rapidly evolving society, although time distortion isn't involved, and I'd swear that I've seen something else with a similar premise a long time ago. The Doctor's little subplot is itself something of a trope; I've seen a bunch of stories in which someone who intended to go only for a short trip ends up being gone for a lot longer, sometimes when only a very short time seems to have passed at their starting point--DS9's "Hard Time", in a way, and for that matter this entire series. But this version is done so well, with his unexplained son, and his talking sports with Retz, even the crew's finding him by scanning the opera houses. If the show missed a trick with the message written in English, they made up for it in small details such as having grab bars inside the observatory for the inevitable tremors. Sometimes I'm mostly just doing these rewatches to see if there are details or themes that I may have missed or forgotten from my original watching of the episode, but this is one that I genuinely enjoyed the second time around. I also think that there may be a recurring theme, of Voyager and by extension the show itself, being observed and commented on externally; see "Living Witness" and "Pathfinder" as well. Particle of the Week: Tachyons, hands down. Daniel Dae Kim is a familiar face for anybody who watched Angel or Lost, among a pretty long list of stuff I didn't happen to catch. Per the usual, a fine choice. * This is silly but still a classic. Despite these and many other possible quibbles, this episode is great. Agreed. For me, this is up there with Distant Origin, and for a lot of the same reasons: they took a very silly idea and just ran with it earnestly, and the whole thing is charming enough to carry the weight of the ridiculous problems. - That the resolution is peaceful - they never decide to shoot back. It's never even in question. 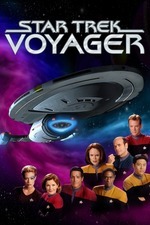 This is an element Voyager got right reasonably often. - Chakotay geeking out over the anthropological implications. I was right there with him, and I was glad the show acknowledged it. - They sneak in a good use of Naomi and Seven's friendship. - This is a rare time that a Prime Directive argument actually makes sense on all sides, instead of someone being very obviously wrong (or the whole thing being nonsensical). This story is a rare example of 'Voyager as I wanted it,' and I've been looking forward to it for a while now. This is a really great episode, and it's the one I usually recommend if someone wants to experience a great bit of Voyager. It always bothered the hell out of me that Voyager just happened to show up during the 2-3 days (our time) in the humanoid species' natural development where they advanced technologically to Voyager's level. Also, if Voyager hung around in the neighborhood for a few weeks, the planet could develop actual practical spacefaring technology, including perhaps the ability to send Voyager back to Earth, no? But then I shut myself up with shouts of IT'S SPACE MAGIC, JUST ENJOY IT and I repeat to myself it's just a show, I should really just relax. But then I shut myself up with shouts of IT'S SPACE MAGIC, JUST ENJOY IT and I repeat to myself it's just a show, I should really just relax. This is the Voyager watchers' mantra. _Dragon's Egg_ and its sequel _Starquake_ (by Robert L. Forward) are two of my very very favorite hard SF books, and "Blink of an Eye" did an outstanding job of retelling that story in a very Star Trek-ish way. Aside from some minor twitchery about writing (as noted above), this is easily one of the cleanest and well-told stories in the VOY canon. I repeat to myself it's just a show, I should really just relax. It always bothered the hell out of me that Voyager just happened to show up during the 2-3 days (our time) in the humanoid species' natural development where they advanced technologically to Voyager's level. I guess I was reading too much into it, but I've always figured that the presence of Voyager may have helped inspire these people to drag themselves out of medievalism (like a less existentially-freaky Monolith). I got the sense, especially in the early scenes, that the Reallyfastplaneteers' culture had a rigid, potentially static quality, which the Groundshaker could've played a role in working against. Also, if Voyager hung around in the neighborhood for a few weeks, the planet could develop actual practical spacefaring technology, including perhaps the ability to send Voyager back to Earth, no? Heh, can't argue with that! But the writers were never gonna do that, which means if they DID have Voyager stick around, their only alternative might have been for us to witness the aliens live out the cynical answer to Fermi's paradox, and sheesh, talk about a downer ending. I guess I was reading too much into it, but I've always figured that the presence of Voyager may have helped inspire these people to drag themselves out of medievalism (like a less existentially-freaky Monolith). That was what I got from it too. It's a little simplistic, but it fits with a lot of stories we saw in TOS. Heh, can't argue with that! They may be stuck, barring my aforementioned joke about them just ascending to beings of pure energy. On a cultural note, I guess it's possible Janeway just would've felt weird asking after Voyager caused them centuries of earthquakes. One thing that occurred to me is that the Voyagerquakes might have not only spurred their use of iron to make more tremor-resistant structures, but also may have exposed more iron ore for them to find and use. And WRT warp technology, given that most FTL travel in the Trekverse depends on verterium cortenide (the stuff that makes up the warp coils in the nacelles), Earth developing warp drive in 2063 may have depended on a single meteorite of the stuff falling into the hands of Zefram Cochrane. Earth developing warp drive in 2063 may have depended on a single meteorite of the stuff falling into the hands of Zefram Cochrane. The timeline I'm from Zefram Cochrane wasn't an earthling. Also, even though there's no canon date of creation for impulse drive, I tend to go with the non-canon statement from the Khan books that the Botany Bay used impulse engines, which would explain its being found in a sector far from populated space. C- Cochrane was totally the kind of guy to become so annoyed by his fame that he'd go live on another planet, even back when doing so was rare and possibly even unprecedented. It doesn't prove anything, but it's a *really* weird turn of phrase in current continuity, especially since he made the most important discovery in Earth's history. During the TOS era, I always figured Alpha Centauri was colonized via impulse drive. And it's possible Earth had them during First Contact, it just didn't seem like that kind of place, and the timetable gets weirder and weirder the further we get from original airings. Canonically, Alpha Centauri was inhabited when humans first got there. I'd have to dig up my copy of the _Star Trek Spaceflight Chronology_, published around the release of TMP, for more details. Here's the Memory Alpha entry. I maintain this leaves the whole 'Zefram Cochrane of Alpha Centauri' as a really weird turn of phrase, but it makes a reasonable amount of sense with all other details. Delightful episode. The narrative compression around the Doctor's son, combined with the Doctor's definitive (and preceding, so Doctor Beta will never have known that Doctor Alpha had a son) transtemporal slip, was lovely and merciless, even if intended as a joke. I had completely forgotten about Forward's books by the time this episode initailly aired, let alone by now. That said, it's a fair cop.